Back in January 2007, Washington Post reporter Gene Weingarten conducted a sneakily ingenious experiment, conspiring with world-famous -- and current uber-cute Cyber crush of Jen-Luc Piquant -- classical violinist Joshua Bell. He had Bell don a baseball cap ("The better to hide that dashing mop of hair that flops endearingly into his eyes whenever he plays," gushes a besotted Jen-Luc) and spend 45 minutes busking in one of the busiest Metro stations in Washington, DC: L'Enfant Plaza. (And just for the record, DC residents, it is not pronounced "leh-FONT.") Hidden video cameras recorded the reactions of passersby. In April, Weingarten's story about the results appeared and ricocheted around the Interwebs: only one person recognized Bell out of more than a thousand harried commuters bustling through the station, and only a handful stopped to listen. It was a bit of a blow to the city's pride; residents like to think of themselves as being fairly cultured and sophisticated, nay, even discriminating -- and yet nobody perceived the greatness in their midst that fateful day. (Yes, I know there are many reasons for this; no need to rehash all the excuses here.) All told, Bell collected a measly $32.17 for his efforts, while Weingarten went on to win the 2008 Pulitzer Prize for feature writing. Good thing Bell didn't need the money. The guy travels all over the world performing, and his instrument of choice is a 300-year-old Stradivarius violin called Gibson ex Huberman, dating back to 1713 -- when the famed Cremona violin-maker Antonio Stradivari was at the height of his prowess -- and valued at just under $4 million. And it just so happens that Stradivari's name was evoked repeatedly this week at a mega-acoustics meeting in Paris. A brief confession: We have been in deep, disappointed denial about missing the Acoustics '08 meeting, but let it not be said that we cannot selflessly set side our private pain to bring you some of the fascinating research news that's emerged as a result of all that accumulated brain power. For instance, intrepid acousticians all over the globe are still hot on the trail of "Stradivari's Secret": a.k.a., just what is it about a Stradivarius violin that makes it sound so much better than your average, run-of-the-mill version? It's been a topic of feverish investigation and much hot debate for a good 10 years or so, and the latest offering in the burgeoning scientific literature is a new Dutch study that employed medical equipment to study these priceless instruments. Specifically, Berend Stoel from the Leiden University Medical Center (LUMC) collaborated with a renowned luthier named Terry Borman put several Strads (and some modern instruments, for control purposes) into a CT scanner to study the materials properties of the wood out of which the violins had been made. Several current theories about why Strads sound so good rest upon the notion that it's all about the wood used to make the instruments. For instance, some theorize that Stradivari used Alpine spruce that grew during a period of uncommonly cold weather, which caused the annual growth rings to be closer together -- so the wood was abnormally dense. The problem is that no two pieces of wood are exactly alike, so sculpting the wood -- delicately shaving the top and the back to get the best acoustical properties -- is critical. A team of researchers from Mid Sweden University has been investigating computer models of violins for years, attempting to match in simulation that telltale Stradivari sound -- including simulating that sculpting process. Another prevailing theory has to do with the varnish: namely, that Stradivari used an ingenious cocktail of honey, egg whites, and gum arabic from sub-Saharan trees -- or perhaps salts or other chemicals. Joseph Nagyvary, a professor emeritus of biochemistry at Texas A&M University, made headlines in November 2006 when he claimed it was the chemicals used to treat the wood -- not necessarily the wood itself -- that was responsible for the unique sound of a Stradivarius violin: salts of copper, iron and chromium, all of which are excellent wood preservers but may also have altered the acoustical properties. He based his findings on studies using infrared and nuclear magnetic resonance spectroscopy to study the chemical properties of the backboards of several violins (the backboard is the instrument's largest resonant component). Anyway, Stoel decided to study the wood yet again, using yet another technology: the CT scan. The problem is that it's tough to study those woody properties without risking damage to this multimillion-dollar instruments. Stoel developed a computer program a few years ago that non-invasively calculates lung densities in people suffering from emphysema, and adapted it to study wood densities from CT scans. He found that while the average wood density of the classical and modern violins "did not differ significantly," according to the accompanying press release, "the differences in wood density between early and late growth were were significantly lower in the ancient violins. Since differentials in wood density impact vibrational efficiency and thereby the production of sound, it is possible that this discovery may explain the superiority of these violins." Since I was not in Paris this last week ("why, god, why?!? "), I missed hearing about Stoel's results in person. Instead, I lounged about the apartment fighting off early-summer ennui and drowning my sorrows with a few Pisco Sours at Ciudad. Ah, but last summer, I was a bit more proactive on the acoustics front. I drove out to Salt Lake City for the 2007ASA spring/summer meeting, and chatted for a good 45 minutes with George Bissinger, a physicist at East Carolina University who also studies violin acoustics. Bissinger had the big Stradivari announcement last year, when he presented the results from his own investigations. Using a 3D scanning laser, he achieved what he said were the most detailed and quantitative measurements to date of the acoustic properties of the Strad violins featured in the study as they vibrate -- essentially mapping out how they vibrate to produce those heavenly tones. The measurements are so quantitative, in fact, that it's possible to reconstruct the stiffness properties of the wood used to make the Strads, perhaps finally making it possible for modern instrument makers to replicate those unique acoustical attributes. Bissinger is tall, slim, with cropped salt-and-pepper hair, and glasses, and while perfectly amiable, he's not really one for casual chitchat; he's more the quiet, deep-thinking sort. In other words, he doesn't exactly stand out in a room full of scientists -- until you get him talking about violin acoustics, that is. Then he positively vibrates with intensity and becomes the most loquacious companion on the planet. That level of passion seems to be present in many who study Strad violins, never mind those who play them, like Joshua Bell (although a delusional Jen-Luc Piquant swears his passion for her trumps even his love for his Strad). The Cremona craftsman would no doubt find this quite gratifying. Bissinger's actual talk was only about 10 minutes, and he didn't have any sound clips on hand. But he did show some pretty nifty 3D animations of the in-plane motion as the violin is played. (It's a huge file and requires a special viewer program, but Bissinger swore it was well worth the trouble of downloading. I still didn't, but am sure it's my loss.) Conducting this sort of experiment with bona fide Strads is a major logistics undertaking; Bissinger says it took him several years of careful "networking." First, he had to borrow two of the world-class instruments from private collectors -- no doubt having to pry the cases from the owners' panicked fingers on the train platform. Train platform as in, Amtrak. Yes, they took no special precautions in transporting them: the instruments were brought by train in plain cases. Sometimes being inconspicuous is the best security in the world. A violin organization generously footed the bill to insure the instruments for the 2-1/2 days of the experiment -- you know, just in case the scientists dropped one or accidentally destroyed their tonal purity. Bissinger also brought in three other, lesser violins of varying quality for comparison purposes. For the actual experiment, he hung each of the five violins by elastic bands, then struck the wood of the top plate with a little hammer, recording and measuring the vibrational modes with the 3D laser scanner. Bissinger specifically wanted to measure the in-plane and out-plane motion: the in-plane motion is the source of much of the sound energy, and this converts into out-plane motion, which produces the rich tonal sounds we associate with fine violins. In addition, he hired a world-class violinist to play each of the violins used in the study for an hour so, to get the feel of the instruments, and then offer his subjective ratings for each one. The musician's subjective analysis was then compared to the objective acoustical data. Not surprisingly, Bissinger had a lot to say on the topic of what makes a Stradivarius violin so acoustically superior. "The big secret about Stradivari is that there is no one secret," he insisted -- no elusive key or magical formula that, once discovered, will magically make it possible to reproduce the sound quality of a Stradivarius instrument over and over again on a mass scale. Bissinger believes it can never be reduced to blind routine, because there are so many different factors that go into making a world-class instrument. It's as much an art as it is science," he told me. "You wouldn't ask Leonardo da Vinci to reproduce the Mona Lisa en masse, perfectly, every time." For Bissinger, an instrument maker is just as much of an artist as da Vinci: "He is the bridge between the artist and the scientist, both of whom speak very different languages and have different concerns. The maker has to speak to both." 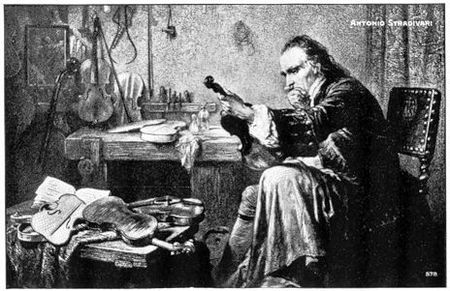 Certainly Stradivari was more than a simple craftsman: "He had some kind of conceptual understanding of the science behind what he was dong, even though physics technically wasn't round yet," said Bissinger. But he knew that doing one particular thing would have a desired effect, and he built on accumulated knowledge: each instrument was an improvement on the last, at least through Stradivari's Golden Period. But while Stradivari's emphasis on geometry gave us the signature shape of a violin, Bissinger says there is little evidence this has anything to do with the famous "Stradivari sound." After all, Guarveri also produced exceptional instruments and wasn't nearly as fascinated by geometry. Not every Stradivarius sounds alike, and frankly, says Bissinger, even a genuine Stradivarius violin isn't all it's cracked up to be sometimes. The passage of time can exact a devastating toll. Many of Stradivari's surviving instruments have deteriorated to the point where they are primarily collector's items. Play a violin too frequently, and the parts wear down and must be replaced, altering the sound; play it too little, and the sound deteriorates, too. Most of the Strads still played today do not have all their original parts, although Joshua Bell prides himself on the fact that his Strad still boasts the original varnish. Still, even Bell adapts his playing to his instrument to get the sound he desires. Bissinger claims there is no "perfect" instrument, and Stradivari -- who devoted his life to the quest for perfection -- would probably agree. As for the claimed acoustical superiority of the instruments, yes, they do sound lovely, however, "There's way too much psycho in the acoustics," according to Bissinger, referring to a subfield known as psychoacoustics. Basically, the very name Stradivari instills respect and awe, and this can't help but influence how people subjectively evaluate and/or respond to the instrument. "The truth is, there are many very fine world-class instrument makers today, producing violins that can hold their own against the Strads, but their names don't evoke the same awed reverence, and thus the perception is that they are not as good," Bissinger told me. In fact, more professional violinists play Guarveris than Strads, which have only become fashionable fairy recently. Really, who wants mass-produced Stradivarius instruments, anyway? It's always been all about the craftsmanship. Ironically, while he was still alive, Stradivari -- while hugely successful at his craft -- was not considered the best violin-maker in the world, although he certainly dominated the industry along with Amati and Guerneri. They were the Holy Triumvirate of the Golden Age of Violins, and after they died, the instrument entered into something of a acoustical Dark Age. Later instrument makers didn't share that all-consuming passion for improving the process to create ever-more-superior instruments: they just cranked out instruments the way it had always been done, with predictably pedestrian results. Way back in 1819, physicist Felix Savard observed, "It is to be presumed that we have arrived at a time when the efforts of scientists and those of artists are going to unite to bring to perfection an art which for so long has been limited to blind routine." Here we are, almost 200 years later, still trying to map out all the details, still chasing down an elusive secret that might not even exist. Perhaps that ability to capture our imagination 300 years later is the true magic of Stradivari. *Sigh* Craftsmanship. It really is a marriage of scientist and artist and a mastery of technique and materials. Rote mass production will never replicate it, any more than it can replicate whatever it is that makes great art. I'm not sure science will ever be able to discover what that magic combination is, but it's certainly not something that can ever be reproduced by a mere machine. Ask any artist. Personally, I hope they never really figure out how to duplicate the sound of a real Stradivarius. Reducing a true work of art to the commonplace is something that technology is sometimes too good at. Some mysteries are worth preserving. Really enjoy your blog. Thanks for doing it. Half of what you write about is over my head, but it's always informative and educational. Ah, Will, on behalf of the self-employed, may I say that you're making a classic erroneous assumption: that busking can be compared to a full-time salaried position. :) In fact, one's "take" while busking depends entirely on foot traffic through the station, which is heaviest during prime commute hours (let's say 7 to 9 AM, and 5 to 7 PM). So really, we're looking at $42.50 an hour for four hours -- AT BEST -- or fully half your estimated salary: say, around $44K per annum, assuming Bell did this four hours a day, five days a week, with no benefits whatsoever (health insurance, retirement plan, etc). That, of course, completely ignores the fact that the madding crowd is whimsical, if not mercurial, and he could make $42 one hour, and only $12 the next. My own annual income fluctuates wildly -- as it does for every freelancer I know. I think we can all agree though, that we hope Stradivari's secret remains elusive, thereby preserving the mystery. And I'm always thrilled that people appreciate the blog, so thanks not just for reading, but commenting! Very interesting post - I love your blog. Personally I hope that we do produce instruments with similar psychoacoustics. For alas someday all of the existing Stradivari will be gone, and what will capture the imaginations of future audiences? BTW, old guitars (dating from the 1950s or thereabout) benefit from a similar psychoacoustic effect among guitar aficionados. Oh my, I love this topic.. In Summer 2002, I was bitten with the curiosity bug of the sound of Cremona violins after reading a Scientific American web contest to try to tell the difference between a Nagyvary violin and a Stradivarius violin. I had some difficulty with distinguishing the pieces. I used a variety of techniques including performing a wavelet analysis and an FFT on the given violin samples, and a wavelet analysis of a sound sample of Nigel Kennedy playing a Stradivarius. What I really love about the Cremona violins story, is that each of these instruments has had devoted owners over the course of their few hundred years life time, so if you imagine that you are the violin, then you experience different lives, different worlds, different cultures. I love this facet of the instruments, and was pleasantly surprised that someone made a movie about exact this facet! It is called The Red Violin. The moviemaker did a great job. Then when you add the beauty of the instrument, the embedded cultures out of they were born and continue to live, along with their fascinating acoustical science.. well .. now you know what kind of topic turns on my passions.